The internet and social media have opened up a new universe to a generation of poets in India and given a new wind to poetry publishing. But has this democratization happened at a cost to quality and fundamentally changed the contours of what we once understood as poetry? Almost 2,400 years ago when Plato conceived of his ideal republic, he banished poets from it. Poets, who then included a range of performing artists, were outliers and misfits, Plato said. They filled people’s heads with nonsense, hence were not to be trusted. The reputation stuck. Over two millennia later, ask any trade publisher in India, especially in the English language industry, about their poetry list, and the response is usually prefaced with mournful apologies. Poetry doesn’t sell (like most literary genres these days, one is led to believe); it disappears into the black hole of the publishing universe, where self-help, romance and mind-body-spirit form the most luminous constellations. Yet, oddly enough, against all good sense, the appetite for writing poetry remains insatiable. Publishers, big and small, also lament that they are flooded with manuscripts of poetry. The market forces may all be conspiring against it, but poetry remains stubbornly alive—as a private pursuit, secret pleasure, or a vehicle of social commentary. And now, thanks to the internet and social media, it doesn’t have to depend on a publisher’s whim to find its way into the world. The revolution launched by the Instagram poets of Canada, the US and the UK—Rupi Kaur, Atticus, Nayyirah Waheed, Nikita Gill, and others—has hit India, too, in the last five years. Social media poetry is not only influencing the overall publishing landscape but also the way we read, write and think about poetry. Performances of spoken word poetry are a rage across the urban landscape, mostly drawing in young audiences, who are likely to be weaned on bite-sized verse arranged artfully on insta-squares. Popular Indian poets on social media, such as Akhil Katyal, Harnidh Kaur and Priyanka Paul (also widely loved for her illustrations), have followers in the thousands, a bulk of them millennials. Their huge “success" online seems to have demolished the last bastion of “gatekeeping" in poetry. Once the preserve of the literary elite, poetry is now a free for all. In August 2016, Wired reported on a Google project that fed 11,000 unpublished books into an AI engine, including 3,000 “steamy romances", to induce it to write poetry. The bot did its best but it wasn’t nearly good enough. One of its poems went: “i went to the store to buy some groceries./ i store to buy some groceries./ i were to buy any groceries./ horses are to buy any groceries./ horses are to buy any animal./ horses the favorite any animal./ horses the favorite favorite animal./ horses are my favorite animal." In Australia and Canada, scientists working on a similar challenge were slightly more successful. Their AI wrote sonnets that almost made sense. If, like AI bots, you feel lost trying to write poetry but still badly want to, there are apps these days that can help you coast along (PortaPoet, Haiku Poem, Poet’s Pad—you’ll be spoilt for choice once you start looking). From AI-generated verse to Atticus (the pseudonymous masked poet from Canada with over 940,000 followers on Instagram), poetry in the internet age exists in a continuum. Like 26-year-old Rupi Kaur, Atticus sells in the millions in print across the world. He is adored for lines such as, “Love her but leave her wild." It doesn’t matter if such sentiments leave the more traditional reader of poetry wild (or not)—the internet is falling madly for Atticus. “Whether we’re inclined to engage in hand-wringing or hallelujah-ing, it’s here to stay," says poet Arundhathi Subramaniam, who ran the celebrated Poetry Circle in Mumbai with Jerry Pinto and Ranjit Hoskote in the 1990s. But, while applauding the democratization of verse that the internet has made possible, she also echoes a familiar “old concern": “How to be inclusive without being indiscriminate?... How do we preserve rigour, such a vital prerequisite in all art?" she asks. “And while it is actually possible to be heard now, is anyone really listening? The art of listening—subtle, attentive, fine-tuned listening—is probably one of the biggest casualties of the digital age," she says. In the pre-internet era, it was the “gatekeepers" (editors, critics, teachers) who helped us find our way through the cacophony of voices vying for our attention. By enabling anyone to publish at the click of a few keys, or express an opinion about everything, the internet has made the very idea of gatekeeping deeply unfashionable. Social media, as Subramaniam says, has handed us a “megaphone" to relay our emotions to the whole wide world. That isn’t an inherently bad thing, so long as it doesn’t drown out those who prefer to “murmur". Poet and translator Sarabjit Garcha, who established the Copper Coin imprint in 2013, prefers the word “curation" to “gatekeeping". “Sensitive curation of a poet’s work can help it flower," he says. “It’s the duty of an editor to tell a writer what should be polished, published, or put away in cold storage." One of a handful of independent publishers working against odds to sustain a platform for poetry, Garcha prints about 300-350 copies of the books he publishes. One of his recent titles, Paper Asylum by Rochelle Potkar, is a collection of haibuns, an intricate form of Japanese poetry that braids prose poems with haiku. Such formalist verse may feel rather last season now, and Potkar admits as much. “In 2013, I did try the pantoum and the villanelle, and found these liberating, though with certain restrictions," she says. “Free verse, in contrast, felt like the open sky. Fly wherever, make amaranthine patterns." In 1917, Marcel Duchamp put a urinal inside the white cube of a gallery and called it art, thus redefining the terms of engagement in the art world. In the 20th century, free verse had a similar impact on poetry. It released poets from the fetters of rigid forms and provoked them to take bold chances. In the 21st century, social media poetry, with its brevity and visual appeal, seems to be drafting a new set of rules again. Retweeted, regrammed, and shared all over the internet, it is indeed flying free as a bird. While the tearing hurry to like and share “content" is a natural consequence of the transient nature of social media, it doesn’t mean there is one definition of “internet poetry" we can all agree on. “Beyond a vague idea that ‘internet poetry’ is lightweight and ephemeral, I don’t know if it has been studied and theorized or even examined very much," says poet Sridala Swami. “It’s possible that it is its own genre but it’s too amorphous a thing for that to be true." What is undeniable, though, is its incredible reach. “It brings Nagaland closer to Norway," says Linda Ashok, poet and founder of the RædLeaf Foundation for Poetry & Allied Arts..
“For me sharing has always been an integral part of writing poetry," says Katyal, 33, on the phone from Delhi, where he lives. Author of two volumes of poetry, he is seamlessly multilingual, moving between English, Hindi, Punjabi and Urdu with élan. A prominent queer activist, Katyal rouses the crowds at the Delhi pride every year with his verse. Sample this rebuttal to the 2013 Supreme Court ruling that upheld Section 377 of the Indian Penal Code, which had the effect of criminalizing the LGBTQ+ community: “Minuscule minority"—the judges kept on barking,/ clearly they’ve never been/ on a Sunday evening to the/ park above the Palika parking." This instant sense of connection on social media has altered a fundamental dynamic between poets and readers. “The poet is no longer an intangible entity," says Mumbai-based poet Harnidh Kaur, 23. “Instagram has enabled the possibility of real-time interaction between poets and readers." She draws inspiration from everything around her—including her work in public policy. From love and heartbreak to sexual violence and feminism, her poems cover a wide ground, and are often addressed to her friends and family. There are the usual hits and misses, but when you have some 24,000 followers looking at your posts, it’s hard to take either lightly. The evolution of a writer, Kaur feels, is a more vulnerable process now, with their work being exposed to relentless public scrutiny. Writing for a medium like Instagram can be a bit like being on reality TV for authors—imagine the potential of social media as a giant CCTV camera. Just as it can be protective and foster a sense of community, it can also be unforgiving in its criticism. Katyal, who has been writing a short poem every week in The Times Of India since August, is also aware of the unpredictable gaze of his readership. Twitter and Facebook, he says, are rougher terrains to navigate than Instagram, where there are less chances of being ambushed by trolls. “Earlier my readers on social media were roughly between the ages of 16-26, but the demographic has now expanded to include people in their 40s, since I started writing in a newspaper," he says. Writing for social media, Katyal says, has also affected his style. “Shorter poems are shareable, mobile poems travel easier," he says. “There was a time when I spent several days to a month on one poem, but I’m attempting less and less of those." For Tishani Doshi, though, social media has mostly been enriching. “It has the dynamism which allows for collaborations with music, movement, photography, video," she says. A trained dancer, Doshi often choreographs her work into powerful pieces, liberating the poem from the page as well as cyber space, as she has done with her recent collection, The Girls Are Coming Out Of The Woods. “I still find the greatest pleasure with a book of poems, and I’m not at all alarmed by a poem that refuses to fit neatly into an insta-square," she says. “But I am equally curious and enchanted by the ways in which poetry is being spread now." 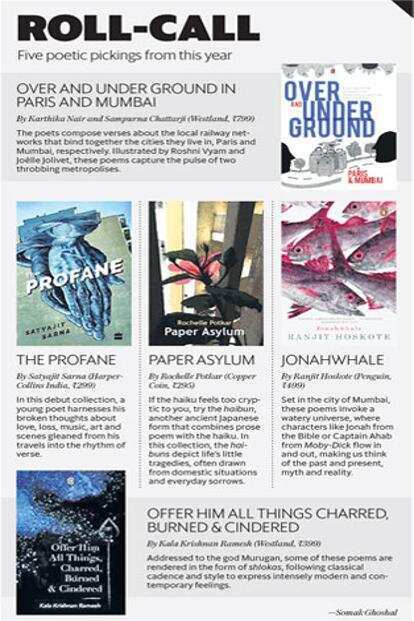 “The sociology of Anglophone poetry in India has certainly changed during the last decade or so," admits poet, art critic and curator Ranjit Hoskote, whose collection Jonahwhale was published to critical acclaim earlier this year. English poetry, he says, has shifted from its “key ecologies"—“academia, journals, little magazines, reading circles and mainstream publishers"—to online platforms (poetry in the Indian languages, in contrast, still thrives within this more conventional ecosystem). But the move hasn’t been unidirectional. “Instagram poets appear in print, too, do they not?" he asks. Rather than as a war between the old and the new, Hoskote perceives the current scenario as a “widening spectrum of interfaces between poets and their audiences". “Social media has its autonomy, but it can also be invitational—it can lead readers to the performance venue, or the printed page," he says. “Ultimately, poetry is a social art, and the social media explosion has only emphasized this reality." Two years ago, a story in Lounge (“Poetry gets its say", 23 September 2016) surveyed the burgeoning scene for performance poetry in India. The urban young, it was clear, have something urgent to say about their world—and many of them want to say it in verse. Poetry slams and spoken-word poetry events continue to mushroom a dime a dozen. “The performance of poetry has opened up a new market," says Akshaya Bahibala, who runs the charming Walking Bookfairs bookshop in Bhubaneswar, Odisha, with Satabdi Mishra. Poetry in print may have a small readership but the duo have big plans to take it to the people. In 2015, Bahibala and Mishra embarked on a pan-India tour to promote reading, especially among those who found it difficult to access books. With a mobile library of 4,000 titles, stocked in a “book truck" (a Maruti Omni van), they drove for over 10,000km and through 20 states, reaching out to hundreds. On 13 December, the couple will begin another such journey, this time to exclusively promote poetry, driving another 10,000km for three months, cross-country. “We want to carry 500-1,000 titles this time, along with a sound system," Bahibala says. “The idea is to invite people in different parts of the country to join in and perform poems." Such impromptu street readings, he believes, may bring in new audiences for poetry. Earlier this year, Bahibala and Mishra undertook another experiment when they sent out a public call on social media for submissions to an anthology called 100 Poems Are Not Enough. “We wanted the book to reflect voices from across the social spectrum—women, young people, Dalits, the LGBTQ+ community," Bahibala says. Initially the idea was to seek a contribution of ₹ 500 from each of the 100 poets featured in the collection to cover the cost of production. But not everyone was willing to pay. Worse, in spite of the relatively lenient editorial standards, only 79 poems made the final cut. “The book may not be a classic that endures for 50 years, but we were not worried about the quality of English grammar," Bahibala says. “We were interested in the quality of emotion expressed in each poem." A few weeks later, Pan Macmillan India picked up the title and co-published it. As a gesture, this was an indication of a shift, however slight, in the radar of trade publishing. Poetry can no longer be simply ignored. “It’s because of the ubiquity of poetry online that publishers cannot dismiss the genre anymore as something that doesn’t work," says Karthika V.K. of Westland. While Westland publishes only two poetry titles every year, its rivals Penguin Random House (PRH) and HarperCollins India (HCI) keep the number between two and four. The print runs usually vary between 1,000-3,000 copies, rising up to 5,000 in exceptional cases. Although these numbers haven’t changed much in the last five years, the attitude towards publishing poetry certainly has. Of course, indie publishers have been fighting much tougher battles to keep poetry alive for far longer. Ashok, for instance, who is employed in the corporate sector, runs her publishing programme with her own fund. She continues to amplify new voices in India with the RL Poetry award every year and gives the winner a publishing contract. “Some businesses will make a small impact, they are not meant for the ROI model," she says. Publishing poetry may be still a niche “business", but “poets", as we know, number in the hundreds. Smruti Divate of Poetrywala, an independent poetry imprint based in Mumbai that she has been running with her husband Hemant Divate since 2003, says there is a deluge of submissions. “We were receiving such huge number of manuscripts, most of which were unfit for publication, that we started charging a non-refundable reading fee of ₹ 1,000 to assess a work," she says. Comparing poetry on social media with traditional channels of publication is like measuring commercial cinema against art-house films, she adds. “It all depends on whether as a poet you like being fashionable or prefer to stay stylish." Yet, the decisive influence of the internet is hard to deny or discredit. As Sohini Basak, editor of the poetry list at HCI and an award-winning poet herself, says. “For our upcoming queer poetry anthology, edited by Aditi Angiras and Akhil Katyal, we made the call for submissions public on various social media platforms and had it translated into different languages. The response has been overwhelmingly positive." As a published poet, though, she is more ambivalent in her feelings. “A culturally crucial aspect of a printed book of poems is to invite slowness and reflection," she says. “It’s only the page and the reader, and the engagement is in the thinking and in wondering if the words you have read have changed the way you think—it’s not in finishing your consumption of it by clicking a ‘heart’ button." “Going by what’s ‘trending’, it isn’t clear whether complex, difficult poetry has got more readers," adds Richa Burman of PRH. It’s a thought that finds resonance in poet Satyajit Sarna’s experience too. Having just published his debut collection, The Profane, with HCI, he says the most common response he hears to the idea of a book of poems is: “That’s nice, but I don’t get poetry." “The answer from me is always the same," Sarna says. “Did you read it out loud? Did you give it a chance to sing?" Poetry on the page is like a record in its sleeve, as Sarna puts it evocatively, “If you don’t put it on the player, can you really judge it?" When you break it down to the basics, poetry on the page or screen has to pass this test of readability: it has to roll off the tongue, stimulate the brain, move the senses. “It is the most concentrated form of language," as Garcha says. It may fall flat or fly on either media. “The internet takes poetry to another medium, but that doesn’t necessarily mean anything in terms of what is getting published," says poet and writer Meena Kandasamy. “We’ve always had extremely well-crafted, powerful poems alongside doggerel in print. It’s the same with the internet; different medium, same phenomenon." The truth of this statement had hit home for me in the early 2000s, long before the internet invaded my life. In those years, as a student of literature in Kolkata, I first learnt rhetoric and prosody from P. Lal, legendary teacher and founder of The Writer’s Workshop, one of India’s foremost independent publishers of poetry in English. Once a week, Lal would come to class with a stereo and play a song by The Beatles to explain the intricate workings of meter and rhyme—it was by humming Let It Be, for instance, that we figured out the trochee meter. Getting to appreciate poetry this way, by testing it out on the senses, is to glimpse its mystical power (if there is any at all), and savour the bursts of pleasure hidden in its nooks and crannies. The best poets in the world—be it Shakespeare, Bob Dylan, Sylvia Plath or Tagore—always enthral us with their unique magic. If the icons of Instagram are having the same effect on millions of their doting fans, who is anyone to complain?